December 2011: Uses of algae I. Let's start from motivation: why would we want to use bio-fuels (produced from corn, grass, algae etc.) instead of fossil fuels (coal, petroleum, and gas)? The fossil fuel industries have supplied our needs for energy for over a hundred years. In addition, the question is confusing as stated, because fossil fuels are also a bio-fuels. 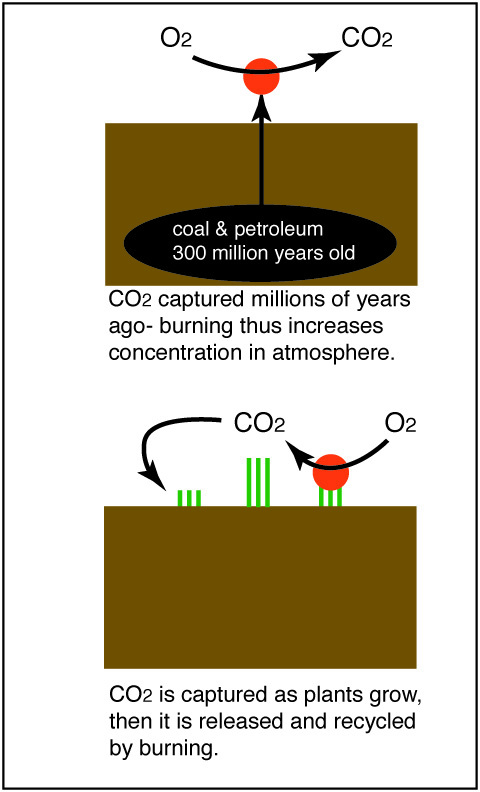 However, the fossil fuels come from plants that grew millions of years ago, and were then compressed and heated under the earths crust to produced the localized deposits of coal, oil, and gas that we use today. In contrast, the term bio-fuel is used to refer to fuels obtained from plants grown within a few years of use. There are two problems with fossil fuels. First, our huge demands for these products mean that it is difficult for us to be self-sufficient. This is particularly true for petroleum. We need to import petroleum from many areas that are politically unpredictable and unstable. Our requirement for oil produced in foreign countries could (and some will say has) lead to painful and very costly military actions. A second problem with using fossil fuels is the production of carbon dioxide (CO2) during their combustion. Carbon dioxide in the atmosphere reflects infra-red radiation coming from the warm earth back to the earth. It is thus called a "green house gas", because the green house glass roof is designed to reflect infrared irradiation from the plant beds back to the beds. The carbon dioxide concentration in the atmosphere has been increasing steadily during the last 100 years in proportion to the combustion of fossil fuels. The average temperature of the earth has been increasing along with the CO2, and this increase in temperature is likely to cause humans considerable grief. However, when bio-fuels are burned the CO2 released is approximately equal the the CO2 consumed a year or so earlier when the plants grew. Thus the total CO2 concentration in the atmosphere remains constant. In order to appreciate the role algae derived fuels might play in our economy you need to compare it to the present (2011) use of corn derived ethanol as a fuel. Corn derived ethanol can be considered the present "gold standard", not because it is the best, but because it is the major bio-fuel. Corn is the major crop (by value and mass) produced in the United States. A small fraction of corn production is directly consumed by humans, most is used as food for cattle, pigs, and other livestock. An even smaller fraction is fermented to produce ethanol. Most of this ethanol production, subsidized by the government, is blended with gasoline. At low concentrations the ethanol functions mainly as an anti-knocking agent (increasing the octane), but at higher concentrations it can represent a significant fraction of the energy released by the gasoline when it is burned in engines. 1. Diversion of corn to ethanol production results in an increase in the price of corn that is used for food. This cost increase is a hardship to the poor. 2. So much energy is used in the production of corn (synthetic fertilizer, cultivation, transportation, fermentation, purification) that the net energy is obtained is less than 50 percent of the usable chemical energy in the ethanol. Thus, you don't get much of a reduction in net CO2 production, nor relief from dependence on petroleum. 3. Ethanol is partially oxidized carbon, and the ratio of H to C is also high. Thus, the energy per kilogram is low compared to diesel or jet fuels. 4. Water is completely soluble in ethanol, and thus ethanol based fuels tend to pick up and transport water into the fuel system even if the original ethanol stock is dry. This water corrodes tubes and pumps that are not constructed of resistant metals. Thus, "normal" engines must be modified to use fuels containing more than 10 percent ethanol. 1. Does not increase the price of food. 2. Current demonstration-scale plants do not use the same amount of energy as required by corn ethanol production. Bio-diesel is produced by extraction from algae and a simple chemical treatment. This is a less complicated process than the fermentation and purification needed to produce ethanol from corn. 3. Bio-diesel is very similar to petroleum diesel. It has almost the same energy density and has only a slightly higher affinity for water. No modification of engines is required. Bio-diesel can be made from oils extracted from several crops, e.g. soybeans. I am not competent to comment on the relative technical merits of soybeans versus algae. However, soybeans are an important food for humans and livestock. Using soybeans for bio-fuels is thus much more likely to increase the price of food than the use of algae. The US has a large amount of coal, enough to supply our energy needs for several hundred years. Coal can be burned in advanced electrical generating plants which filter atmospheric poisons like sulfur dioxide and coal ash. With even more technology the CO2 can be removed from the flue gas and sequestered deep in the earth. This solves the global warming issue. Of course such an advanced plant costs money, and the electricity costs more. Such a plant couldn't compete with a "normal" plant unless the government placed a heavy tax on CO2 emissions. While coal itself is not useful to power vehicles, the electricity coal can produce can charge batteries, and thus power vehicles. Finally, there is nuclear power. When a nuclear power plant is running well, it presents no problem. The trouble is that an improbable event can cause the release of large amounts of radiation that can kill many people and make a large land area uninhabitable. The more improbable an event is, the more difficult it is to be sure of its probability. The present designs of nuclear plants are inheriently unstable, they run safely only when active components, e.g. cooling systems, work properly. It is possible to build a nuclear power plant that is inherently stable, but the power density is low, and thus it is more costly. Finally there is the issue of the storage of nuclear waste. This has not been solved in the United States after five decades of effort. In my opinion the main problem is political, but maybe that means it is much less likely to be solved in the near future.